We added on an extra day last minute. It was super easy and the woman who helped us was delightful. Beautiful cottage that overlooks amazing views of the vineyard. Walking distance to tasting room and only a short drive to other vineyards and breweries. We will definitely be staying here again! We loved it all! It was our honeymoon. Your team members were always informative, courteous, professional, and friendly. The Stay Charlottesville team was very responsive, even during the Christmas season. Thanks so much! We enjoyed a wonderful Christmas at the Pryor Haynes House! We may have liked this house even more than the Stay Charlottesville property we stayed in last Christmas. The house is perfectly situated within a short walk to the Downtown Mall and a short drive to everywhere else in Charlottesville. The main floor - with the spacious family room, kitchen and pool room - was perfect for hanging out and entertaining. We'd love to stay at Pryor Haynes House again! As always, the Stay Charlottesville was very responsive and helpful. Thanks so much! The East Town Abode has great views of the surrounding neighborhood. The apartment is also within a short drive or pleasant walk to the Downtown Mall. The two-bedroom apartment was perfect for our party of five and had everything we needed. The apartment is also ideally located for driving to Monticello, Michie Tavern and the Monticello walking trail. The team was excellent. Hillary is the best! Great neighborhood, walkability to downtown mall was perfect. The house itself exceeded our expectations, the kitchen was well stocked and the house overall was extremely clean and included all of the amenities required from our family. They could not have been more helpful. The house at Stony Pointe was great. Our whole family loved the design of the house and how cozy it felt at night. It was close enough to Charlottesville where we could go see things and not have to drive an hour back to the house. We very much enjoyed the property and look forward to maybe staying there in the future. I loved this mountain getaway! It was the perfect home away from home for my family during Thanksgiving. The beds were comfortable, the amenities were plentiful, the kitchen had everything we needed for cooking every night and cooking a full Thanksgiving meal, and the view was to die for! The perfect atmosphere to wake up to every morning. I contacted Stay Charlottesville through their website and Hilary promptly responded with what we needed. She actually recommended the home we ended up staying at. It turned out to be the perfect spot for our honeymoon. 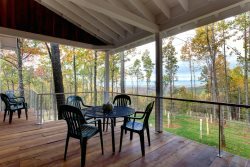 We had a fantastic stay at the Broadhead Mountain Retreat! The home is MUCH bigger than the pictures portray. The great room is mostly windows so you get a fantastic view of the sunrise/sunset and beautiful landscape all around. The private overlook just a ways past the home is fantastic (We drove. The hike is a little steep in parts.) and could even be used for a small get together (note the house rules about guest capacity though). Because of how long we stayed, a washer and dryer would've been the cherry on top. But we still had a wonderful stay! Private and intimate, yet close to everything, which is just what we wanted. The house also has everything you need. Just bring your own food and snacks (there were plenty of seasonings in the cabinets and coffee as well. We also found some board games). A TIP ABOUT DRIVING DIRECTIONS: We were able to put "Lonesome Mountain Rd" into our GPS using the "Waze" app. That's the house address, minus the house number. This lead us to the main road the house is located on without problems. From there, we followed the directions provided by Stay Charlottesville. We arrived after dark ... wouldn't recommend that, given the twists and turns but we managed ok :). We drove a VW Beetle and did just fine going up/down the mountain. If snow or very rainy weather is in your forecast, 4 wheel drive would probably be best. There is a sign pointing to the house, so if you haven't seen the sign ... keep going. There were a few times we wondered if we'd passed the house ... because the miles feel much longer on a mountain :). Thank you Stay Charlottesville! We will definitely be back and try other properties as well. I'm sure they're all as nice as this one given the great management. Anna Quillon is a gem. Very nicely designed. Sound machine was a nice touch. Great lcation. You guys were fantastic! And, can't thank you enough for mailing me the phone charger we left plugged in!!!! Great house - loved the separate bath rooms!